When you’re researching venues, why not take a look at Hillscourt – the hotel and conference centre at the foot of the beautiful Lickey Hills is an ideal location for your ceremony and reception. The 55 en-suite bedrooms mean there’s plenty of room for your guests to make a night of it, while the idyllic grounds will add a touch of elegance to your photos. Capturing the special moments of your day comes naturally to Arch Photography, with professional photography and videography available to ensure you can always look back and remember the people and places that brought your dream wedding to life. If you’re having the wedding breakfast in a local hall or perhaps your own home or garden, you’ll need to organise catering – and Lin’s Bakeaway in Barnt Green can offer a huge range of delicious home-made treats to order, from finger food to more substantial casseroles, tagines and pies, plus the all-important cakes and desserts! Decoration of your venue is also an essential part of a wedding, so let Oasis Flowers & Balloons of Barnt Green take care of providing gorgeous table arrangements – and of course the bouquets and buttonholes for the wedding party! Flowers are also a great way to say “thank you” to mums and bridesmaids. Of course, everyone from the wedding guests to the bride herself will want to look their absolute best for the big day, and Bliss Hair Therapy in Alvechurch specialises not only in hair styling and extensions but also wedding makeup and spray tanning. You’ll need the perfect jewellery for the perfect outfit, and Coconut Pink creates unique designs using vintage and contemporary beads – the range includes pretty charm bracelets which are always a hit with younger bridesmaids. In all the beautification, don’t forget about your feet – they might need a bit of TLC after the winter, and Foot Care by Julie Larner can help get those tootsies into tip-top condition before you hit the dance floor – or jet off to the beach on honeymoon! On the subject of honeymoons, Blackwell travel counsellor Jane Ward offers independent advice on the best location to suit your needs, and can also help arrange a wedding abroad (see Sharron and Harry’s story, below). 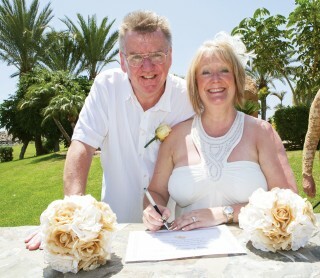 Blackwell travel counsellor Jane Ward helped a Lickey End couple plan their overseas wedding. Getting married is one of the biggest decisions in your life and it should be one of the happiest and most memorable days in a couple’s new lives together, write Sharron and Harry Cunningham (pictured, top). When we decided to have our special day abroad, we followed a recommendation and sought advice from Jane Ward, an independent travel counsellor who truly lived up to – and went beyond – her motto: “With me. . . it’s personal”. Jane recommended the Lopesan Costa Meloneras Resort and Corallium SPA on Gran Canaria, where we enjoyed a truly five-star experience. Jane also organised a local wedding co-ordinator (Bernadette) who advised us and organised everything – the venue, the local marriage registrar, photographer and the wedding breakfast. We got married on Anfi Island which is heart shaped and very romantic. We had a really special day that will remain in our hearts and memories forever. Our wedding and honeymoon would not have been as special without the outstanding level of customer service Jane provided – her attention to detail is what sets her apart. We will continue to use Jane for all our travel needs!